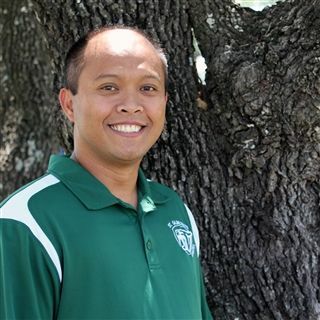 Jay Tiangco is the Athletics Operations Manager and PE Assistant at St. Gabriel’s Catholic School. He joined the St. Gabriel’s family in 2016, bringing with him 9 years of teaching experience. Jay sums up his love of teaching with the following quote from John F. Podojil: “Teaching is not a profession; it's a passion. Without passion for your subject and a desire for your students to learn and be the best in the world, then we have failed as a teacher and failure is not an option.” He believes that passion cannot be fakes—you either have it or you don’t. He is committed to being a passionate teacher who strives to make his areas of expertise simple, interesting, enjoyable, and important for his students. Jay creates an environment in which the students feel safe, respected, and challenged. A native of Manila, Philippines, Jay earned his bachelor’s degree in Behavioral Sciences/Organizational Systems Development from De La Salle University. Jay speaks English and Tagalog. In his spare time, Jay loves to cook amazing Filipino food for his family, golf, play just about any sport, scoping out the best restaurants in Austin, or planning a dream vacation to Germany. Stop by and ask Jay about the beautiful, white sand beaches and warm hospitality of the 7107 islands of the Philippines. You can reach Jay at: JTiangco@sgs-austin.org.